A brand new trailer is making the rounds for Dawn of the Planet of the Apes, coming to theaters in July of 2014. It seems that the virus revealed at the end of 2011′s Rise of the Planet of the Apes did not in fact wipe out Humanity, though it gave it the old college try. Now the remaining humans and the tribe of evolved apes (lead, of course, by Caesar) have gone to war, and then formed an uneasy truce. That peace is fragile though, and war seems like it is always just on the horizon. 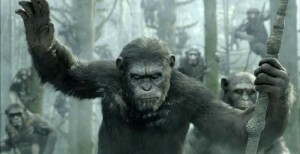 Once again, Caesar the CGI chimp is modeled by the multi-talented actor Andy Serkis. Taking over the reins for Rise’s director Rupert Wyatt this time is newcomer Matt Reeves, perhaps best known as the director of the “reality monster movie” Cloverfield. Currently 20th Century Fox’s official site for the film only has the trailer up, but that will probably be added to as we swing into the new year. See what we did there? Technically, I should note that neither group depicted in this movie or its prequel are monkeys, they are both apes. Yes, we already live on the Planet of the Apes! It was Earth all along!